Why Did Yesterday’s Market Rout Miss the Big Wall Street Banks? ← Why Isn’t the Justice Department Bringing Treasury-Rigging Charges Against Wall Street? Wall Street knows something that the rest of us don’t. Based on past experience, when Wall Street keeps secrets it never works out well for the rest of us. We’re thinking about the time Wall Street banks colluded on rigging prices on the Nasdaq market; or the time they rigged their research departments and told us to buy stocks that they were secretly callings dogs and crap; or the time they got S&P and Moody’s to give them triple-A ratings on subprime pools of debt while keeping it a secret that they had internal reports showing the loans didn’t meet their origination standards — and then they went out and secretly shorted that debt while continuing to sell it to their customers as a good investment. 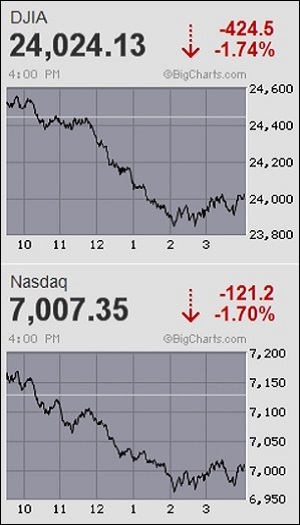 Yesterday, something decidedly weird happened as U.S. stock markets were being pummeled. Three of the biggest Wall Street banks – JPMorgan Chase, Bank of America and Citigroup – handily outperformed the broader market. That’s an anomaly that simply doesn’t make sense unless some type of manipulation is going on. The banks should be trading at least in line with the broader market and, more realistically, worse than the broader market because they hold loans to the companies that are collapsing in price. On top of that, these three banks hold trillions of dollars in derivatives which are hard to quantify using any measure of safe and sound banking practices. And on top of that, according to the U.S. Treasury’s Office of Financial Research, Wall Street banks are holding massive exposure to European entities, including hundreds of billions of dollars in off-balance-sheet credit derivatives – the instruments that played a significant role in blowing up Wall Street in 2008. To understand just how abnormal this is, let’s take a look at what happened between July of 2015 and January 19, 2016. That’s when these three banks were showing losses far in excess of the broader market on most down days. From its July 2015 high to January 18, 2016, Citigroup lost 30 percent of its market value. Bank of America lost 22 percent in the same period while JPMorgan Chase lost 19 percent. The Fed had begun its long process of normalizing interest rates with its first rate hike since the financial crash on December 16, 2015. It hasn’t looked back since. Rising rates are never good for Wall Street banks (despite what you read) because it makes it harder for the banks’ loan customers to survive and pay back their loans while also making the banks’ stock dividend less attractive compared to U.S. Treasury yields. Yesterday, the 10-year U.S. Treasury note reached a 3 percent yield for the first time in four years, which should have added another headwind for the three big Wall Street banks. And yet, magically, it didn’t. There are two dubious aspects of today’s Wall Street that may help to explain yesterday’s big-bank outperformance. In June of last year, JPMorgan Chase announced it might buy back as much as $19.4 billion of its own stock over the next 12 months. Citigroup projected potential buybacks of $15.6 billion while Bank of America said it might buy back as much as $12 billion. The second dubious aspect is that Congress and the Securities and Exchange Commission continue to allow these mega Wall Street banks to engage in trades of their own stock in their own Dark Pools – effectively unregulated stock exchanges inside the bowels of the banks. This brand of hubris is on a par with the conditions which led to the 1929 crash and Great Depression as revealed in the U.S. Senate hearings of the early 1930s. “Five years after the official end of the Great Recession, corporate profits are high, and the stock market is booming. Yet most Americans are not sharing in the recovery. While the top 0.1% of income recipients—which include most of the highest-ranking corporate executives—reap almost all the income gains, good jobs keep disappearing, and new employment opportunities tend to be insecure and underpaid. Corporate profitability is not translating into widespread economic prosperity. As mainstream media continues to focus on the Russian probe while ignoring the dangerous and growing concentrations of risk on Wall Street, and regulators fail to take the necessary actions to protect the public, it’s up to the individual to protect himself and his family from a replay of 2008 – or worse.